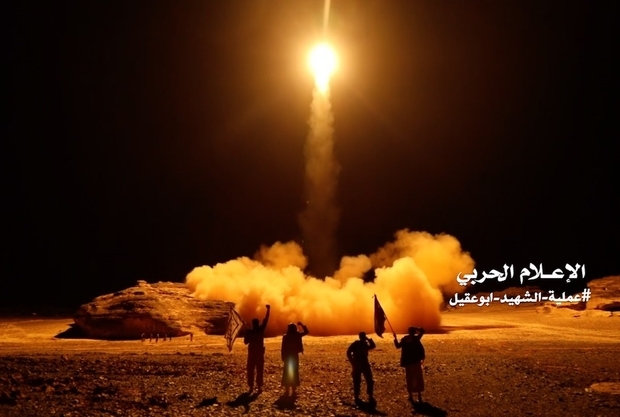 Saudi air defense system forces intercepted over capital city Riyadh a ballistic missile launched by Yemen Houthi rebels who have stepped up attacks against the kingdom in response to its military intervention in the poorest Arab country languishing in a three-year conflict. At least three blasts were heard and three clouds of smoke were seen in the sky above the capital, reports say. The unmanned missile, according the Saudi defense, was targeting Abha international airport in Asir province. 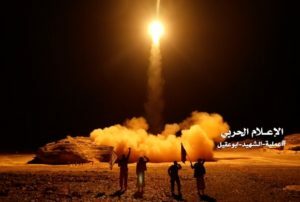 A second ballistic missile over the southern city of Najran aiming at “a civilian target” was also intercepted in Jizan province. The rebels’ news outlet Al Masirah TV earlier on took to Twitter to announce two attacks. The media said the missiles targeted the Abha international airport and Saudi oil company Aramco in Jizan. The latest missile attack marks the fourth time in five months that missiles have been targeting the most powerful Sunni kingdom and its capital. Saudi Arabia has been since 2015 leading a Pan-Arab coalition in Yemen in view of propping up President Mansour Hadi, himself flashed out from capital Sana’a by the Houthis.